Greenfinch (Chloris chloris). Male. Taken at Otmoor, Oxon., on April 13th 2017. Male. Taken at Otmoor, Oxon., on April 13th 2017. 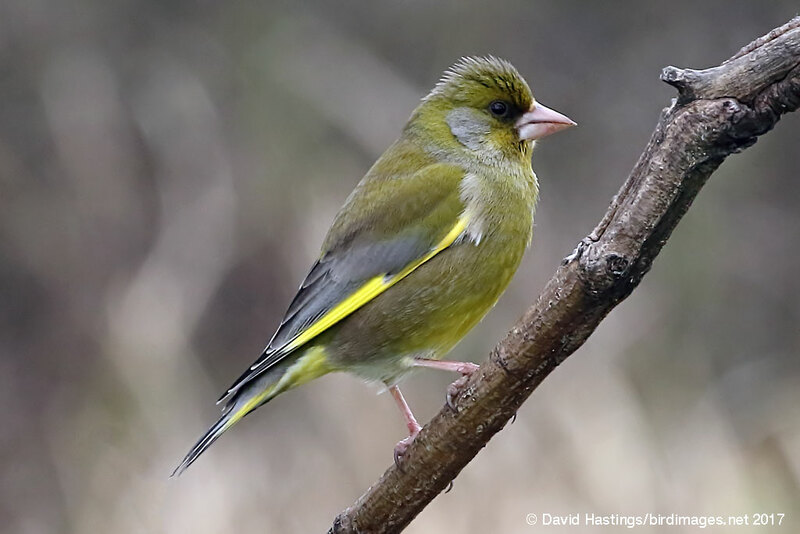 The Greenfinch is a rather stout finch. The male is unmistakable with a yellowish-green breast and yellow edges to the primary feathers. The female is rather duller, with less yellow on the wings and tail. It found throughout the British Isles, but is only a summer visitor in north-west Scotland. It breeds at woodland edges, in wooded pasture and copses, and in parks and gardens. Some British birds spend the winter in southern and western Europe, but most are resident. There are about 1.7 million pairs in the UK.